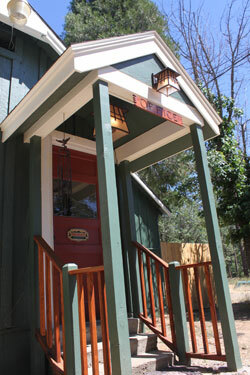 The Timberjack Lodge is the one and only motel in the Hayfork valley. Renovations of all 12 rooms were completed the spring of 2015. The motel was designed to be an authentic reminder of simpler times. Its rustic style belnds naturally with its wilderness surroundings and features a redwood deck facing west. The park like setting of the motel grounds includes a Fire Pit, a BBQ Area, and Horseshoe pits. We also offer complimentary DirecTV, HBO, and Wi-Fi in all of our rooms. The journey to the Hayfork Valley passes through rugged mountains with majestic views. The historic town of Hayfork is only minutes away and is rich with history in the mining and logging industries. There are plenty of outdoor activities year round including camping, hiking, cycling, swimming, fishing and hunting. Winding country backroads offer hundreds of miles to explore by foot, horseback, snowshoe, ski or tire. Be sure to take a moment to revel in the evening sky. Hayfork Valley star gazing is some of the best around. Hayfork also has a year-round calender of events, including the County Fair, Speedway Racing, Farmer's Markets, Barbeque Competitions and Music Events. Check out our THINGS TO DO page for a current list. We would like to thank the good people of Hayfork Valley who offered their support, time and talents to the challenging task of creating the Timberjack Lodge. This truly felt like a community project. To all those who helped, wanting nothing more than for Hayfork to have a nice motel, thank you. Your countless contributions made the renovation a success. We are committed to making the Timberjack Lodge great and we are excited to be part of something that has meant so much to so many people. To my great friends Mike McNeil, Ramblin' Rob, Travis Morgan, Nick & Kathy, Betty Markowicz, Teddy Handy, Romen & Anthony.... Thank you for all your help on this one and for your many years of support and friendship. It could NOT have been done without you!